All-age corps from across the country will gather in Rochester, N.Y. over Labor Day Weekend, Aug. 31 to Sept. 2 for the 2007 Drum Corps Associates (DCA) World Championships. Many members of DCA groups made their drum corps starts as members of Drum Corps International units while others are current DCI corps members who also march with DCA corps. Each summer, several all-age corps have the opportunity to perform as part of Drum Corps International's Summer Music Games Tour. This video highlights three corps who will compete at the DCA Championships—CorpsVets of Atlanta; the Buccaneers of Reading, Pa.; and the Kilties of Racine, Wis.—as they performed during the 2007 Drum Corps International season. 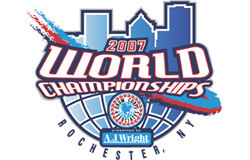 The DCA World Championships this weekend in Rochester will culminate in the final competition on Sunday evening starting at 5:30 p.m. Eastern at Paetec Park Stadium. Visit DCACorps.org for a complete schedule and more information.